Photographers may submit up to three photos of gardens that are located in Freedom, NH. An independent panel of three judges, appointed by the Historical Society Board of Directors, will select the 13 winning photographs based upon the creative interpretation of the contest theme. Four winners will be chosen in each of three categories: Student, Amateur, and Pro/Semi-Pro. Winners will be announced at a reception on Friday, June 27, 2014, the details of which will be determined at a later date. Winning photographs will also be reproduced for public display at the Freedom Historical Society and on this website. Photographs must be submitted in both 5” x 7” print and digital forms. Prints must be on photographic paper and the digital form can be on either CD (preferred), USB file, or sent individually through email (bonniebnh@myfairpoint.net, with “Photo Contest” in the subject line). Photos must be in landscape format and no smaller than 1500 x 2100 pixels. Higher resolutions are encouraged for better quality reproduction. Photographs may be color or black and white. All submissions will receive preliminary review for contest acceptance and will be disqualified if found offensive, to be a studio image, animation/artwork, or of poor image quality. All entrants must grant the Freedom Historical Society nonexclusive rights to use the photos in future marketing and promotion, including but not limited to, the 2015 Calendar. All photos will receive photographic credit. Please respect the rights of property owners and, if possible, seek their permission. In addition, for a photo in which a person is recognizable, you must submit the written permission of the individual with the Entry Form. A 2015 Official Entry Form must accompany your entry along with a $3 fee for each photo submitted. 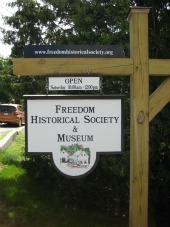 Submit your entries by mail to the Freedom Historical Society, Attn: Bonnie Burroughs, PO Box 548, Freedom, NH 03836. You may also deliver in person to the Freedom Village Store any day between 10 am and 2 pm (in a sealed envelope). Deadline for submissions is April 1, 2014. Address questions to Bonnie at bonniebnh@myfairpoint.net or call 603-539-3665.